Using social media is a must for any business. After all, it’s a great way to raise awareness, create a community and gain loyal customers. The next step is to decide whether you want to use paid advertising rather than relying on organic traffic. 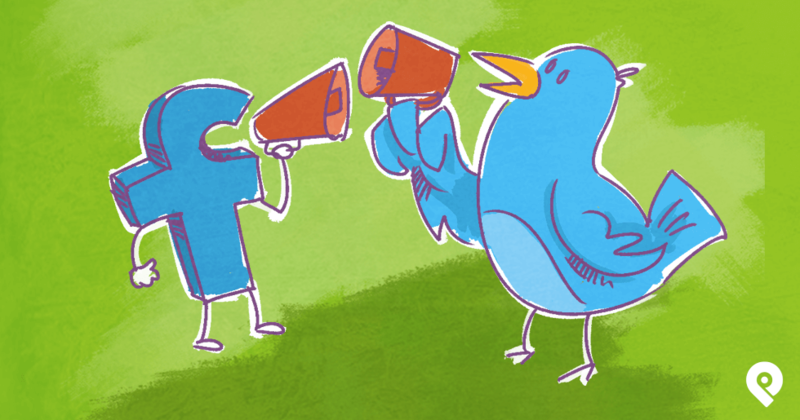 Facebook and Twitter are two of the obvious choices for social media advertising. After all, Facebook has over 1.65 billion monthly active users, and Twitter has 320 million. This is a huge audience for businesses to sell their service or product to. But businesses simply can’t rely on organic posts anymore. Facebook has been cutting back organic reach for the last few years, and in June 2016 changed their algorithm once more. Now, a page’s reach is more dependent on shares rather than organic reach. It’s not surprising there has been a 52% decline in organic reach. With this in mind, it’s clear that the best way to maximize reach and increase revenue is to use Facebook and Twitter Ads. But how can you create ads that reach your target audience and bring in the most revenue? Want the exact formula to conquer Facebook marketing? Here's our no-fail strategy! Targeting your ads is one of the main ways to get real sales on social, and that is true for both Facebook and Twitter. After all, if you’re targeting the wrong audience, they simply won’t be interested in your product or service, and won’t click your ad. You’ll be spending money to end up with no results. Before you start a campaign, ensure that you know who your existing audience is, and who you want to target. Make sure to do your market research. Use data from sources such as Google Analytics to analyse your audience and create a customer database. This will ensure you target your campaign correctly and achieve maximum success. This is an advanced feature which takes advantage of your existing customer database. 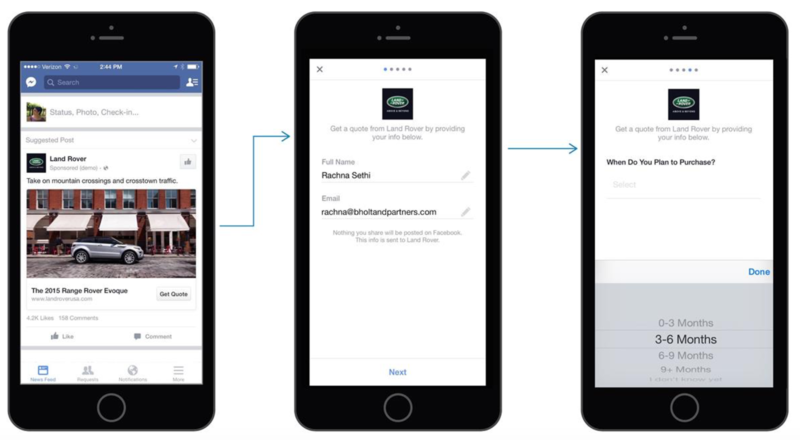 With a custom audience, businesses can upload their existing customers' email addresses, phone numbers or Facebook IDs. ...Which makes it possible for businesses to target either the whole list, or a selection of users on the list. Custom audiences also include Lookalike Audiences, which is what you’ll need to create to expand your audience. A lookalike audience will let you target users who are similar to those on your custom audience list. 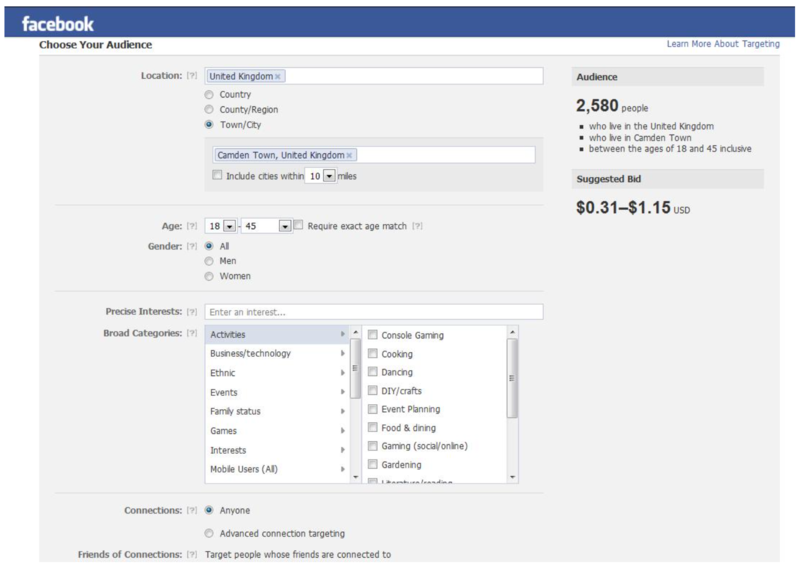 Facebook creates this audience by data points on the similar profile. Age: this one is useful if you know the age range of those who will be interested in your product or service. However, be mindful when selecting this criteria, as you don’t want to exclude potential customers. Gender: allows you to target all, male or female. Location: this is useful for local and small businesses, as you will be able to target or exclude people from a certain geographical area. Language: select which language your target audience speaks. 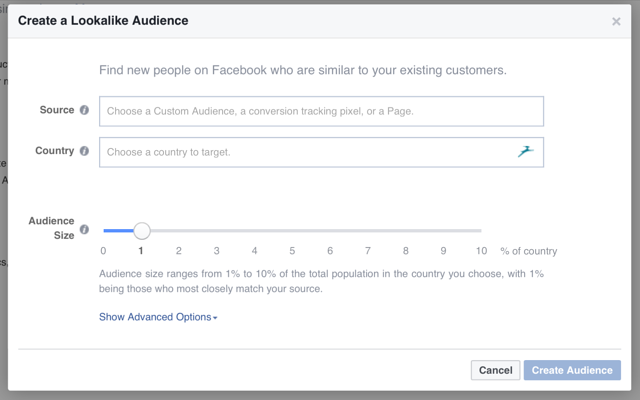 Detailed targeting: this is the option for businesses who are new and entering a market, and want to target people who are unaware of their brand. Demographics: this option allows you to target people based on their education, employment, household and lifestyle details. Interests: reach a bigger audience by targeting interests. This includes posts shared on a user's timeline, apps they use, and pages they like. There are thousands of interests to choose from. You can type in anything you want and Facebook will have a match or something related. This works best when you’re trying to target a large audience. Behaviours: this allows businesses to target people based on their purchase behaviours. This data that is usually gathered from a third party. There are many subcategories to choose from, including: what vehicle they drive, whether or not they are a gamer, what type of bank they belong to, what type of media they consume, what mobile device they use, and whether they are a frequent traveller, etc. More Categories: you’ll be able to find any Facebook or partner categories you’ve requested access to. Geography - target people from a certain geographical area. Gender - target all, male or female. Language - select a language your target audience speaks. 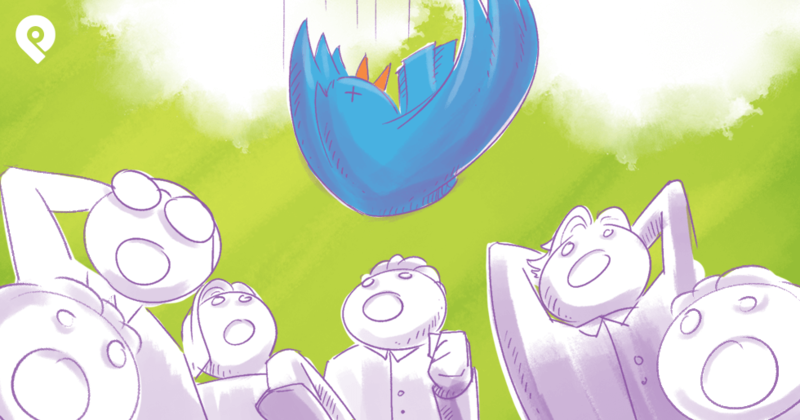 Tailored Audience: this is Twitter’s version of a custom audience. If you already have a list of customers, upload it and Twitter will match its users for you to target. Keywords: using keyword targeting, you will be able to deliver messages relevant to what users have recently tweeted about or engaged with, depending on what keywords you have selected. This allows you to send your ad to those who have mentioned a specific word or phrase. Ensure that you know your clients and who you want to target before selecting the criteria. This way, you won't exclude any potential customers you may have otherwise thought were not visiting your website. In fact, sometimes it’s better to leave options such as gender and age open to avoid narrowing your reach too much. ...So, it’s important to pick the ad format that is most likely to help your business grow its audience. One of the most popular forms of advertising on Twitter is promoted tweets. With so much traffic on Twitter, it’s easy for your organic tweet, or even your paid ad, to quickly get lost in the timeline. 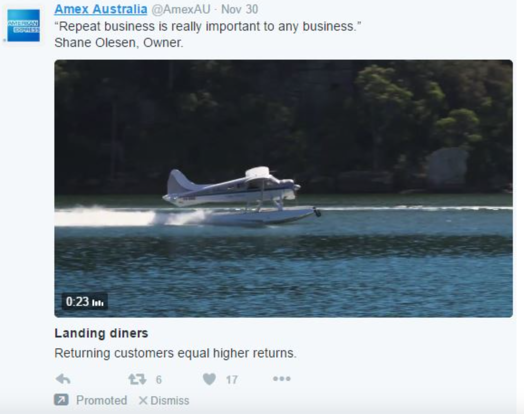 Promoted tweets ensure your ad will have more visibility. They include a photo or video and description. If a user does a search for a specific keyword, a promoted tweet will, most likely, appear at the top of the results. It will also be found towards the top of a user’s timeline. Such promoted tweets act just like regular tweets, which means that users can reply, retweet and like it. 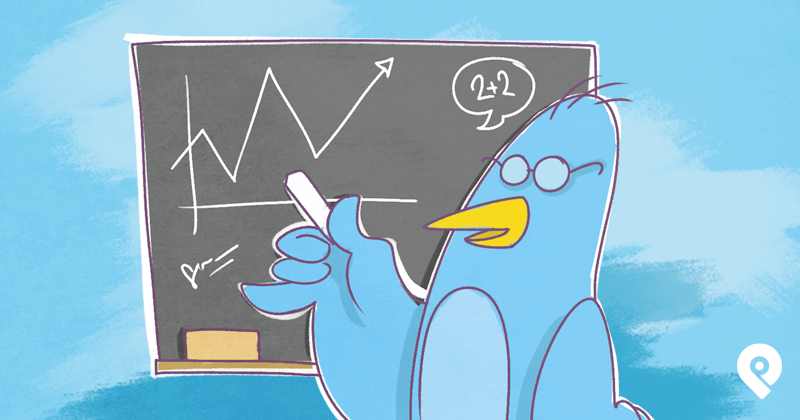 Promoted tweets are highly effective in growing both, awareness and your audience. Twitter also has promoted accounts. These results appear in a user’s search results, under “who to follow” and in the timeline. They're clearly marked as “promoted”. Unlike promoted tweets, a promoted account gives users the option to follow the account. This makes this a very appealing option for those who want to grow their audience. 1. Lead Generation Cards - These let your businesses collect names and emails of potential leads, for either their business or mailing list subscribers. Thus, lead generation cards let you grow your database and increase who you are targeting. 2. Summary cards - Twitter’s default cards, which include a title, description, thumbnail image, and a direct link to content. They are useful for sharing content that doesn’t really need a lot of visual space, such as a blog post. 3. App Cards - drive users to download an app, and are particularly useful on mobiles. This card shows the app’s name, rating, price, icon, and includes a short description. 4. Photo Cards - They visually attract users with a single, full-width photo, which is the main focus of the ad. They also include a title, description and link. 5. Gallery Cards- similar to Photo Cards, but have numerous photographs displayed at once. 6. Player Cards - for businesses in the music, video or multimedia industry, these cards are a necessity. Users are able to watch, listen or click your media, without leaving Twitter. 7. Website Cards - direct people to your landing page with website cards. They feature an image, description, link to your website, and a call-to-action button. 8. Product Cards: for those in e-commerce, the product cards are the option to pick. They include a thumbnail photo of the product, a description of up to 200 words, price, stock availability, and of course a link to the product. 9. Conversational Cards: these cards include a call-to-action with a customisable hashtag. 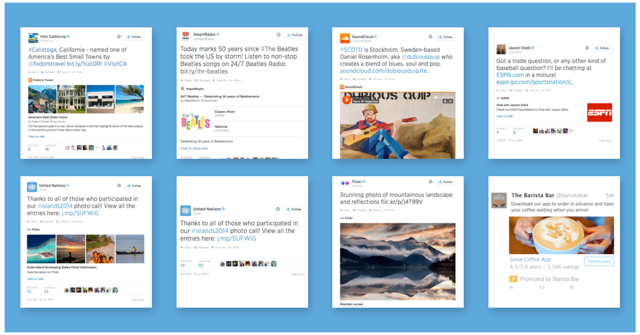 A button on each card generates a pre-populated tweet which users can modify and tweet. 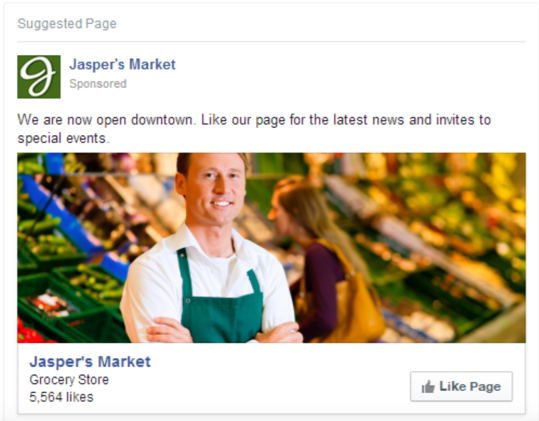 Facebook also has various ads to suit different businesses. Each ad has a different objective, so it’s important to be selective and choose the ad that will help you achieve your goal. The most effective ad for growing an audience is the “Page Like Ad.” This ad will show up in users' News Feeds or in the sidebar showing that one of their friends have liked a certain page. It's cheap and easy to set up. It has social proof. The ad shows pages liked by your friends, making you more prone to like them too. Quick exposure to new fans. Businesses should also consider a Promoted Page ad. Facebook will automatically create the images and copy, which you can edit. You then choose your audience by selecting the correct targeting and choosing your budget. Another effective way to achieve audience growth is by using a Facebook Lead Ad. This ad type was launched in 2015, and can now be viewed on both mobile and desktop devices. Lead ads allow a business to collect information directly from the ads. When users click on an ad, their information is pre-populated, meaning they don’t have to fill anything out. They can then submit the form, all without leaving Facebook. Carousel: features 3-5 images or videos, which users can scroll through horizontally. Dynamic Product: used to target audiences based on their past actions on various businesses websites. Canvas: allows users to scroll through photos, tilt images in different directions and zoom in and out. Domain: the cheapest option, as it is displayed on the right of the News Feed, and therefore only on desktop devices. Page Post Link: displays a large photo in the News Feed aimed at grabbing the user’s attention. Page Post Photo: a large space available for photos. It lets people comment on the ad. Page Post Video: a large space dedicated to video. 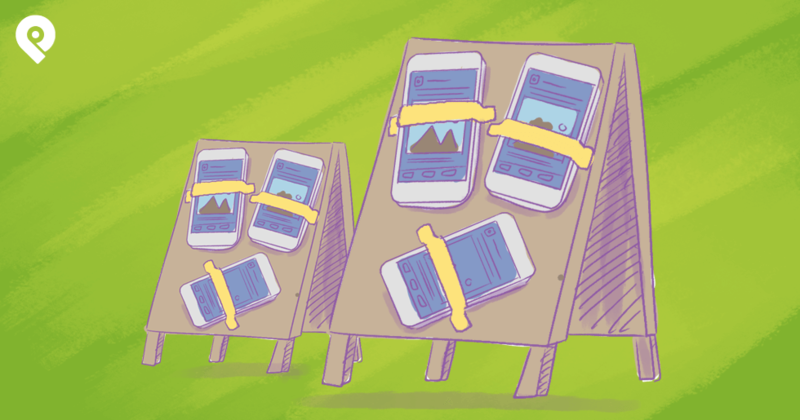 Fortunately, picking an ad format, doesn't mean that you're stuck with it forever. You can experiment with the different formats and find out which one gets you the best results. 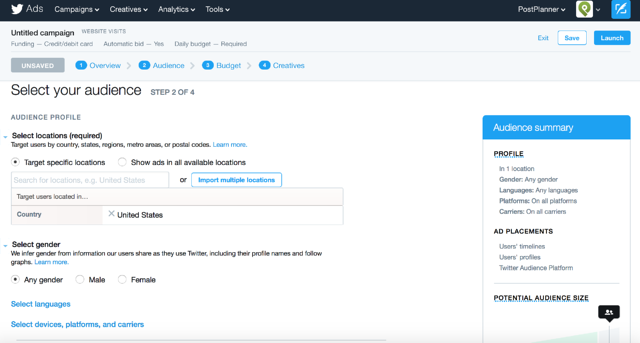 Once you’ve decided on the segment you’re targeting and on the right ad format, it’s time to actually write your Twitter and Facebook Ads. People commenting on the ad will cause it to show up in News Feeds more, and potentially help grow your audience. 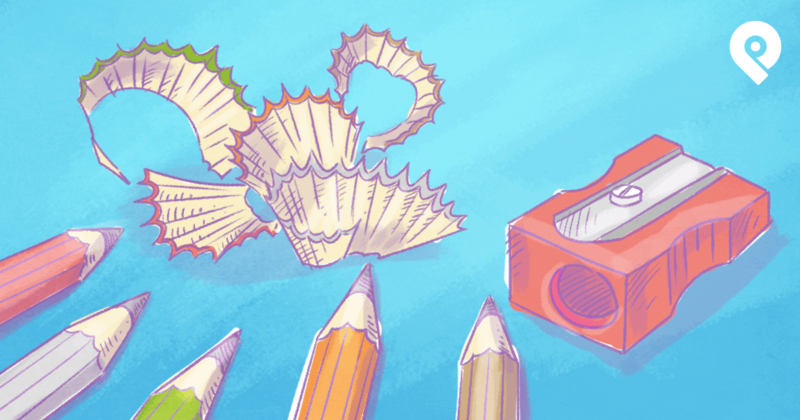 If an ad isn’t getting as much attention as desired, give it a small boost. Make sure to track your advertising campaign so that you know whether you're achieving your targets or not. This way, you'll be able to alter the campaign or target a different segment. This helps you avoid paying for ads that aren't bringing you any results. Getting your content seen is getting harder and harder. But Facebook and Twitter Ads provide a fantastic opportunity to get your content in front of a bigger and more targeted audience, and thus increase revenue. However, just using ads social media advertising is not enough. Do that on Facebook and Twitter ads and you'll see an increase in revenue in no time!